The PA Biotech Center has fostered some extraordinary success stories in the past few years, and those companies now are models and inspiration for the newer start-ups here. Over the past three years, the Pennsylvania Biotechnology Center of Bucks County has created 727 jobs and has spurred more than $1.8 billion in economic impact in Bucks County and throughout Pennsylvania, according to an economic impact study released March 8. Commissioned by the Baruch S. Blumberg Institute, the report by KLIOS Consulting LLC, uses the Regional Input-Output Modeling System (RIMS II) developed by the U.S. Department of Commerce, to measure direct, indirect and induced economic impacts. In addition, the center has created 325 jobs directly associated with the center, 237 additional indirect jobs in Bucks County and 165 jobs elsewhere in Pennsylvania. Created in 2006 by the Hepatitis B Foundation in partnership with Delaware Valley College (now University), the PA Biotech Center converted an abandoned light industrial site north of Doylestown into a state-of-the art biotech center and pledged to replace the 145 jobs lost when the site’s former occupant, the D. A. Lewis Associates Inc. fulfillment center, closed. As the report by Stein demonstrates, in addition to being home to the Hepatitis B Foundation and its nonprofit research institution, the Baruch S. Blumberg Institute, which manages the center, the PA Biotech Center now is home to more than 35 start-up companies. “The Baruch S. Blumberg Institute and the PA Biotech Center continue to be a source of pride to this community, turning ideas and dreams into innovations, medicines, and, importantly, jobs,” said Pennsylvania state Rep. Marguerite Quinn, another early supporter of the center. The PA Biotechnology Center employs an unusual model in which an anchor, nonprofit organization dedicated to drug and diagnostics discovery for liver disease, actively spins out and attracts new companies and entrepreneurs. “That approach is working,” said the center’s Chief Operating Officer Lou Kassa. Many biotech incubators fall short on delivering their promises of helping spur new companies and create reliable jobs, according to a 2015 Kauffman Foundation study. Indeed, most technology accelerators fail, writes Peter Relan, venture capitalist and founder of YouWeb, writing in Technology Link. Michael Sofia, Ph.D., co-inventor of the hepatitis C cure sofusbovir (Sovaldi), started a company at the PA Biotech Center to discover a cure for hepatitis B, using technology discovered and licensed by the Blumberg Institute. Now called Arbutus Biopharma, the company is valued at more than $500 million. Synergy filed with the U.S. Food and Drug Administration (FDA) its first new drug application (NDA) for plecanatide in chronic idiopathic constipation (CIC) on January 29, 2016. If approved, the company plans to launch plecanatide with the CIC indication in the first quarter of 2017. Novira Therapeutics, which was founded to focus on a cure for hepatitis B, recently was acquired by Johnson & Johnson for an undisclosed amount of money. Novira has a hepatitis B drug in human studies. 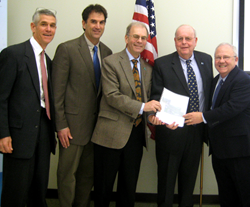 Dr. Timothy Block (center), president of the PA Biotech Center, the Hepatitis B Foundation and the Baruch S. Blumberg Institute, presents Bucks County Commissioner Charles Martin and Jordan P. “Pete” Krauss, executive director of the Bucks County Industrial Development Authority, with a study demonstrating $1.8 billion in economic impact from the PA Biotechnology Center of Bucks County. Joining them, from left, are study author Richard Stein, principal of KLIOS Consulting Inc., and Lou Kassa, chief operating officer of the PA Biotech Center and the Baruch S. Blumberg Institute. About the Baruch S. Blumberg Institute: The Baruch S. Blumberg Institute is an independent, nonprofit research institute established in 2003 by the Hepatitis B Foundation to conduct discovery research and nurture translational biotechnology in an environment conducive to interaction, collaboration and focus. It was renamed in 2013 to honor Baruch S. Blumberg, who won the Nobel Prize for his discovery of the hepatitis B virus and co-founded the Hepatitis B Foundation. To learn more, visit blumberginstitute.org.